All businesses need personalized envelopes which they can use for various purposes. For example, when you need to send an important document, it needs to be sent in a personalized business envelope. Business envelopes are used by almost all corporations big and small. If you want to make a business envelope but don’t want to hire a professional designer in fear of a large amount of money he/she might charge you to make a personalized envelope for you, a quicker and cheaper option is to get a business envelope template from the internet. Getting your hands on business envelope template is not a very hard task. All you need to do is, to search for an envelope template on any search engine of your choice and you will get countless of options. Next, you need to select the design of a template which you like the most. Once you’re done choosing a template, you can download it and then make any changes that you need to be made. For example, you’ll need to add your company or business name, add some contact information or your company’s logo. Most templates let you make the changes necessary. All you need to do next is to just print it out and make copies to get them ready to be folded into envelopes. The internet has so many different types of templates that you will for sure find the one you want or have been looking for. One of the templates prepared and designed by our professionals is given here. Hope this will satisfy your need. First of all, start MS Word from your local computer and open a blank new file and save it with a name for example ‘My new envelope’. Go to ‘Mailings’ and you can see ‘Envelopes’ written at the most left corner of the page. Click it and a new pop up window will appear on the screen. In this window, you can write some detail about your envelope such as Delivery address, return address and can add electronic postage if any. 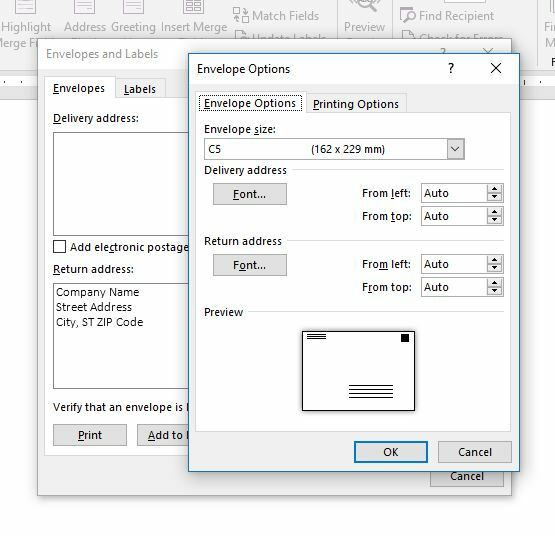 Next, you can click on ‘Options’ to set the size of the envelope you want to print. In the Envelope Options tab, you can see a list of envelope sizes. A drop-down can be used to select the envelope size. The default size given is CS (162 x 229 mm). Many other sizes include Size 9, 10, 11, 12, 14, B4, B5, B6, C3, C4, C5, C6, US Legal and US Letter. 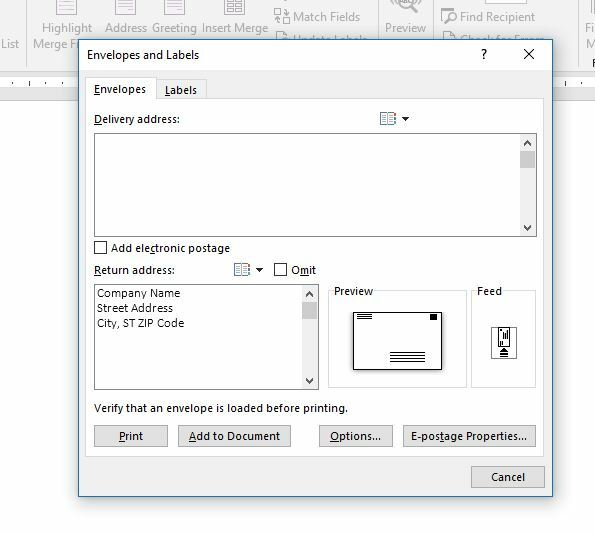 In the ‘Printing Options’ tab select the printing options you want the envelope to print. You can utilize face up and face down options also.